This week I found a Husqvarna 19E on Craig’s list. The seller stated that it was in “excellent” condition and recently serviced. 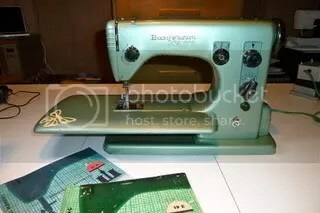 I work downtown and live the burbs, there’s no way I could’ve gone to see this sewing machine on a lunch hour. She was packing and moving and unwilling to meet anywhere so I asked if she would send it by courier, this was the only solution I could think of. I received the machine at the office but was too busy to have a good look. I hauled it onto the train and took it home. Much to my chagrin, this poor thing was roughed up and badly scratched from the transformer being jammed into the case. This machine was brought over from Holland, it has a Dutch manual and Dutch transformer — there’s nothing wrong with that, of course, but any sane person would have protected the machine from further scratches by wrapping the transformer in fabric. Admittedly, this machine is uber quiet and really, I know nothing about it except it was supposed to be worth every penny. “Recently serviced” must mean something completely different to my understanding as there was a thick layer of dust on the knobs. The engine whirred as the needle moved in slow motion and I could not get the bobbin tension right. Someone should tell Suzy that the motor is not placed on the front of the machine but rather on the back of the machine! In her ad, she said it was in “EXCELLENT” condition, not great and the instruction booklet is in DUTCH!! It was clear that Suzy had no intension of refunding ANY of my money. I now have it listed on Ebay for half the price I paid. Lesson learned, NEVER buy anything sight unseen!! Wait. This is a beautiful machine. Is there really anything wrong with it? Have you oiled it? Have you adjusted the screw on the bobbin case? Tension is mainly just about tightening or loosening those two disks in the tension assembly after all. I’ve bought a lot of vintage machines without being able to test them and it’s always a crapshoot. In the scheme of things this wasn’t that bad — if nothing else you know more about the risks of buying an old machine sight unseen.